as well as ease of installation and to optimize overall conveyor performance. It is vital to scrape conveyor belts clean and eliminate problems with carry-back and spillage. Primary conveyor belt cleaners or Pre-Cleaners and Secondary Belt Cleaners. Both types of Belt Cleaners are an essential part of any conveyor system. Razor-Back® Belt Cleaner The Razor-Back® features tough self-adjusting, replaceable tungsten carbide blades. Retractable Razor-Back® System The Retractable Razor-Back® System can be accessed and removed from outside the chute without breaking the plane of the conveyor. Super-Skalper® Belt Cleaner The Super-Skalper® tackles the toughest bulk material handling jobs. Razor-Back MDX® Belt Cleaner Designed for maximum tonnage mining systems running in aggressive environments. TORO™ Reversing Belt Cleaner An effective, flexible solution that is also suitable for reversing conveyor belts. Skalper MDX® Belt Cleaner Built for high speed and high tonnage conveyor systems used for mining. E-Z Skalper® Belt Cleaner Provides effective carry-back removal in the toughest environments. Wash Box™ Belt Cleaning System The Wash Box is steel enclosed and equipped with rollers for better cleaning. Skalper III® Belt Cleaner Skalper blade design with the simple and accurate Force-1 tensioner. Pit-Skalper® Our Pit-Skalper® conveyor belt pre-cleaner is highly effective in challenging service conditions to remove carry-back from the conveyor system. Chevron™ Belt Cleaner Chevron uses the speed and force of the belt rolling over our patented rubber disks. Mini-Skalper® Belt Cleaner Designed for small diameter pulleys where space and size is a factor. V-Plow XD™ A Heavy Duty Plow built for belt cleaning in the toughest mining environments. Excalibur® Food Grade Conveyor Belt Cleaner Configured to meet the most stringent sanitary requirements of the food industry. Hinged V-Plow™ Engineered to effectively keep bulk material becoming trapped within the conveyor. Reversible Diagonal Plow Built with a rugged steel structure to hold up in the toughest mining environments. Replacement Blades Primary Belt Cleaner replacement blades. Dry Wipe™ Belt Cleaner The Dry Wipe Belt Cleaner works hard in tough underground and above ground mining environments. Vibra-Clean Conveyor Belt Cleaner Very effective when used on flexible sidewall style conveyor belts. Vibrating Dribble Chute Prevents buildup in conveyor dribble chutes. Replacement Blade Assembly for Richwood™ Cleaners Retrofits the Richwood™ 1C or 3C Belt Cleaner! Secondary Mounting Bracket Versatile, adjustable, powder coated steel brackets and plates that can be mounted on the conveyor structure. The Tru-Trainer® conveyor belt tracker employs a unique and highly effective tracking action, which is non-damaging to the belt and reacts immediately if the conveyor belt begins to drift off center. 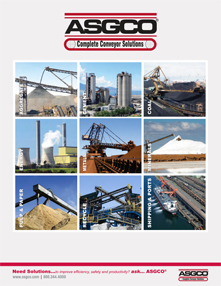 Our conveyor belt tracking products deliver superior performance. Tru-Trainer® Flat Return Idler The Tru-Trainer® offers the most reliable and re-active belt tracking on the market. Tru-Trainer® Dual Return Idler Developed to accommodate excessive forces encountered with wide conveyor belts and heavy loads. Tru-Trainer® Dual V-Return Idler Developed to accommodate the excessive forces encountered with V-Return idler conveyors, systems and structures. Tru-Trainer® Dual Return Urethane Idler Fast and effective conveyor belt tracking, that results in extended bearing life. Tru-Trainer® Tapered Troughing Idler This design is highly responsive and quick to activate on both loaded and unloaded conveyors. Food Grade Tru-Trainer® Lightweight Belt Tracker Proven lightweight conveyor belting tracking, used in the food and material handling industries. Dura-Sleeve™ Idler Patented abrasion resistant urethane sleeve easily clamps on any existing or new disc return idler shaft. Slide-Ler™ Have the ability to change rolls under the conveyor loading skirt area, without having to remove adjacent idlers. MDX Stub Idler The BASSCO Conveyor Belt Stub Idler provides increased sidewall conveyor belt life and is designed for heavy load support. Conveyor Belt Guide Idlers Guide Idlers protect belt edges and flanges from damage if the belt mis-aligns. Dampening Roll Assembly Designed to be used with Vibra-Clean to reduce the vibration caused by the cleaner impacting the belt. Canti-wheel™ Conveyor Assembly The Canti-Wheel allows the conveyor belt to change the angle of inclination. Belt Beaters Belt Beater has been designed to work on the return or "clean" side of flexible sidewall or conventional troughed belts. Standard Double Clamp-Mount® Conveyor Skirtboard Sealing System Help eliminate spillage and dust in the conveyor transfer point with clamp-mount. Clamp-Mount MDX™ (Mine Duty) Conveyor Skirtboard Sealing System Installs easily and stops spillage and dust in the conveyor transfer point. Single Handle Clamp-Mount Conveyor Skirtboard Sealing System Reduces downtime with simple clamp adjustment in the conveyor load zone. Tri-Seal Conveyor Skirtboard Sealing Compounds If dust is an issue, tri-seal offers exceptional sealing in mining, pulp and paper applications. Dura-Seal (ORG) Conveyor Skirtboard Sealing Compound Dura-Seal is the toughest and most cut resistant material available for skirt-board sealing. SX3™ Conveyor Skirtboard Sealing Compound Triple sealing system that provides three sealing surfaces to prevent dust and fine spillage. B&R Dura-Seal Conveyor Skirtboard Sealing Compounds For optimum sealing and minimum wear on the conveyor belt, engineered for harsh environments. Multi-Seal Conveyor Skirtboard Sealing Compounds The multiple sealing action is adjustable, reversible for the full life of the conveyor skirting material. Dura-Tuff™ Urethane Conveyor Skirtboard Sealing Dura-Tuff™ Urethane Conveyor Skirting is a made of an extremely tough 62 Durometer polyurethane skirting that lasts an average of 3-5 times longer than rubber skirting equivalents. E-Z Mount® Conveyor Skirtboard Sealing System Provides an effective solution by preventing dust and material from escaping the conveyor load zone. Conveyor Chute Tail Box Effectively seal at the back of the loading zone to prevent material rollback within the conveyor. External Wear Liner / Skirtboard System An economical upgrade that protects and improves the conveyor skirtboards and sealing system. Slide-N-Roll Conveyor Slider Bed Provides a powerful load support while stopping dust and spillage in the conveyor load zone. 3 Roll Slide-N-Roll Conveyor Slider Bed The patented 3-Roll Slide-N-Roll is the ultimate in loading zone spillage control for high speed and tonnage conveyor belts. Impact Cradle Bed Provides effective conveyor belt support by utilizing bars, while helping to eliminate spillage in the load zone. Quarry Duty Impact Beds Designed to offer an efficient and safe means of protecting the conveyor belt and helping to eliminate spillage / dust in the load zone. Roller Cassette Conveyor Belt Impact Bed & Slider Incorporates the advantages of sealing, while maintaining constant rolling support for the conveyor belt. Pro-Zone™ Modular Conveyor Belt Load Zone System. Lift Bed - Diverter Plow The ASGCO® Lift Bed – Diverter Plow™ is a pneumatically operated impact bed that lifts the conveyor belt from full trough to zero (0°) into a stationary diagonal plow. ASGCO®’s Magnetic Separator overhead magnet is a non-electric suspended separator, suspended over a conveyor or head pulley to remove ferrous metals. Arrowhead Ceramic Conveyor Pulley Lagging Arrowhead ceramic pulley lagging corrects belt slippage and premature wear. Arrowhead Drive and Non-Drive Rubber Conveyor Pulley Lagging Arrowhead Drive and Non-Drive Pulley Lagging eliminates slippage and increases pulley life to improve production. Semi-Ceramic™ Pulley Lagging Semi-Ceramic™ Pulley Lagging provides the solution when conventional rubber lagging fails to correct belt slippage and wears prematurely. ASGCO Safe-Guard products comply with MSHA Title 30. They offer best in conveyor injury prevention. Safe-Guard® Modular Conveyor Flat Guard Guard against moving conveyor equipment and protect workers from injury. Safe-Guard® Conveyor Chute Inspection Doors Safely inspect conveyor equipment while it's running with our inspection door. Safe-Guard® Return Idler Guard MSHA Accepted - designed to prevent injuries from pinch points. Safe-Guard® Heavy Duty Return Idler Guard Works on CEMA E & F series idlers, MSHA accepted, built to last. Safe-Guard® V-Return Idler Guard Safe-Guard® V-Return Idler Guards fits standard v-return idlers, protects workers and equipment from falling idlers and dangerous pinch points. Safe-Guard® Return Idler Cage Preventing injuries and damage to equipment, with easy to install conveyor guarding. Safe-Guard® Return Roll Changer The Safe-Guard® Return Roll Changer prevents injuries and reduces conveyor down time for roller replacement. Sure Grip™ Belt Clamps The ONLY conveyor belt clamp that provides a POSITIVE pressure across the entire width of the belt. ASGCO®'s Vibrating Screens deliver unmatched precision performance – dependable production even under adverse operating conditions, or when handling the most abrasive material types. Custom manufactured Urethane cast products have diverse properties making it the leading choice of engineers looking for long lasting materials for their high load, high stress environments. Urethane Lagged Pulleys & Rollers Wide range of urethane cast rollers and pulleys. Pipeline Products and Pigs Special urethane products to remove deposits which could obstruct or retard flow through a pipeline. ASGCO® Urethane Classifier Shoes Special wear resistant urethane material at the outer edge of the shoe to extend the wear life of the shoe. Urethane Hydrocyclone Liners For classifying and separating particles in a liquid suspension based on density. Urethane Sheets and Linings Exceptionally abrasion resistant polyurethane to solve bulk transport related wear issues. Vul-Con™ Sectional Vulcanizing Press East to set-up and operate. This modular design can be set up quickly and efficiently. Vul-Con™ EZ Series Vulcanizing Press Lightweight compact aluminum frame design, equipped with carrying handles for easy transportation. Wear Liners are designed to be an integral part of any bulk handling conveyor system. Armorite® Skirtboard Conveyor Wear Liners Protect your skirtboard and significantly improve wear life with Armorite liners. Armorite® Smooth Conveyor Wear Plates Provide extreme abrasion resistance across a range of industrial mining applications. Armorite® Grizzly Screen Cap Conveyor Wear Bars Ideal for aggregates and coal, Wear Bars remove fines upstream and spread bulk material evenly. Armorite® Chocky Conveyor Wear Bars An excellent alternative to expensive, hard facing welding methods, available in 5 sizes. Armorite® Conveyor Wear Buttons Ideal for smaller areas within the conveyor system, requiring wear resistant material. Armorite™ Conveyor Wear Knife Edge & Shredder Tips Specifically designated for the sugar and recycling industries. AR™ 400 Hardox Steel Internal Skirtboard Liners Protect your skirtboard and extend the life and effectiveness of your sealing compound. X-Wear™ Ceramic Wear Liners X-WEAR's smooth laminar surface provides optimum sliding for bulk material handling. X-Wear™ Mine Duty Ceramic Conveyor Wear Liners Built with extremely hard ceramics that provide unsurpassed resistance to abrasive wear. X-Wear® Ceramic Canoe Skirt Liners Effective for sealing inside the skirtboard and controls the material until it becomes stable. Urethane Canoe Liners ASGCO® Urethane Canoe Liners are engineered to absorb impact and abrasion in all types of material transfer operations. X-Wear™ Urethane Magnetic Patch & Liner Provides a temporary yet reliable patch system. It can be applied to any steel surface that sustains wear.